Track Rankings in Google & Yahoo. We track Google Mobile rankings too. Track Web Leads via our Form App. Check Visibility across 30+ Important Local Search Engines, Directories and Social Networks. Generate more Positive Business Reviews on Google & Yelp. Simple and easy to understand. The SEO project dashboard will give you a comprehensive overview of what’s happening with your account. The PPC dashboard will give you a birds-eye view of what’s happening with your paid account. These are the active items that require attention. Example, social media login information may be needed, content approval, uploading of code or content, providing PIN verifications etc. Solving these issues help in boosting SEO performance. Conversation is a great way to start a discussion. Once you start a conversation, your account manager will be instantly notified via email with a copy sent to your registered email address on the dashboard. All conversations will be sorted according the time it was last updated i.e. commented on. Shows the deliverables to be performed in the current month with deadline, which gives more transparency to the campaign. You can track down the activities performed on a monthly basis so you exactly know what is happening, what’s done and what’s pending. 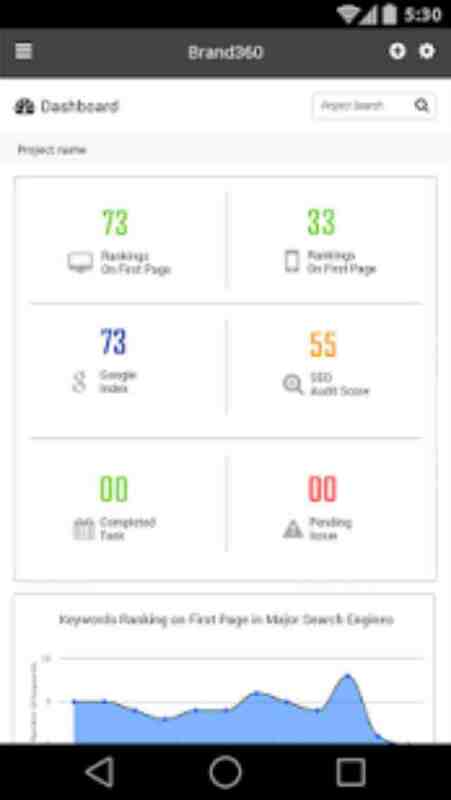 Displays the total number of keywords ranking in Google (Desktop and Mobile) and Bing search engine. Also shows the number of keywords improved and declined since the benchmark date i.e. the first day of the campaign so you know how your campaign is performing. Call tracking allows you to track incoming phone calls thus helping you to fill that gap in your marketing analysis. When enabled, this section shows the number of calls tracked in the current month. Shows overall web traffic performance of your website at a glance. Get snippets of important metrics like total visits, mobile visits, returning visitors and more. The best part is you don’t have to login separately to check your website’s Google Analytics stats. This section fetches all the critical information from the Google Search Console dashboard and presents it in an easy to understand manner. Includes Search Queries, Impressions, Clicks and more. Digital Marketing is not easy. A Typical campaign would involve managing logins for Google Analytics, Google AdWords, Google Search Console, Facebook, Twitter and various third party site like Moz, Ahrefs, SEMRush, Call Tracking etc.What if you can track all this via a single dashboard? No logging into 10 different sites? That’s what we help you do with our Digital Marketing Dashboard.